Hubble Space Telescope observation of the debris ring around Fomalhaut. The inner edge of the disk may have been shaped by the orbit of Fomalhaut b, at lower right. A debris disk is a circumstellar disk of dust and debris in orbit around a star. Sometimes these disks contain prominent rings, as seen in the image of Fomalhaut on the right. Debris disks have been found around both mature and young stars, as well as at least one debris disk in orbit around an evolved neutron star. Younger debris disks can constitute a phase in the formation of a planetary system following the protoplanetary disk phase, when terrestrial planets may finish growing. They can also be produced and maintained as the remnants of collisions between planetesimals, otherwise known as asteroids and comets. By 2001, over 900 candidate stars had been found to possess a debris disk. They are usually discovered by examining the star system in infrared light and looking for an excess of radiation beyond that emitted by the star. This excess is inferred to be radiation from the star that has been absorbed by the dust in the disk, then re-radiated away as infrared energy. Debris disks are often described as massive analogs to the debris in the Solar System. Most known debris disks have radii of 10–100 astronomical units (AU); they resemble the Kuiper belt in the Solar System, but with much more dust. Some debris disks contain a component of warmer dust located within 10 AU from the central star. This dust is sometimes called exozodiacal dust by analogy to zodiacal dust in the Solar System. VLT and Hubble images of the disc around AU Microscopii. In 1984 a debris disk was detected around the star Vega using the IRAS satellite. Initially this was believed to be a protoplanetary disk, but it is now known to be a debris disk due to the lack of gas in the disk and the age of the star. The first four debris disks discovered with IRAS are known as the "fabulous four": Vega, Beta Pictoris, Fomalhaut, and Epsilon Eridani. Subsequently, direct images of the Beta Pictoris disk showed irregularities in the dust, which were attributed to gravitational perturbations by an unseen exoplanet. That explanation was confirmed with the 2008 discovery of the exoplanet Beta Pictoris b. Other exoplanet-hosting stars, including the first discovered by direct imaging (HR 8799), are known to also host debris disks.The nearby star 55 Cancri, a system that is also known to contain five planets, was reported to also have a debris disk, but that detection could not be confirmed. Structures in the debris disk around Epsilon Eridani suggest perturbations by a planetary body in orbit around that star, which may be used to constrain the mass and orbit of the planet. On 24 April 2014, NASA reported detecting debris disks in archival images of several young stars, HD 141943 and HD 191089, first viewed between 1999 and 2006 with the Hubble Space Telescope, by using newly improved imaging processes. During the formation of a Sun-like star, the object passes through the T-Tauri phase during which it is surrounded by a gas-rich, disk-shaped nebula. Out of this material are formed planetesimals, which can continue accreting other planetesimals and disk material to form planets. The nebula continues to orbit the pre-main-sequence star for a period of 1–20 million years until it is cleared out by radiation pressure and other processes. Second generation dust may then be generated about the star by collisions between the planetesimals, which forms a disk out of the resulting debris. At some point during their lifetime, at least 45% of these stars are surrounded by a debris disk, which then can be detected by the thermal emission of the dust using an infrared telescope. Repeated collisions can cause a disk to persist for much of the lifetime of a star. Typical debris disks contain small grains 1–100 μm in size. Collisions will grind down these grains to sub-micrometre sizes, which will be removed from the system by radiation pressure from the host star. In very tenuous disks like the ones in the Solar System, the Poynting–Robertson effect can cause particles to spiral inward instead. Both processes limit the lifetime of the disk to 10 Myr or less. Thus, for a disk to remain intact, a process is needed to continually replenish the disk. This can occur, for example, by means of collisions between larger bodies, followed by a cascade that grinds down the objects to the observed small grains. For collisions to occur in a debris disk, the bodies must be gravitationally perturbed sufficiently to create relatively large collisional velocities. A planetary system around the star can cause such perturbations, as can a binary star companion or the close approach of another star. The presence of a debris disk may indicate a high likelihood of exoplanets orbiting the star. Furthermore, many debris disks also show structures within the dust (for example, clumps and warps) that point to the presence of one or more exoplanets within the disk. The orbital distance of the belt is an estimated mean distance or range, based either on direct measurement from imaging or derived from the temperature of the belt. The Earth has an average distance from the Sun of 1 AU. ^ Wang, Z.; Chakrabarty, D.; Kaplan, D. L. (2006). "A debris disk around an isolated young neutron star". Nature. 440 (7085): 772–775. arXiv:astro-ph/0604076. Bibcode:2006Natur.440..772W. doi:10.1038/nature04669. PMID 16598251. ^ "Spitzer Team Says Debris Disk Could Be Forming Infant Terrestrial Planets". NASA. 2005-12-14. Archived from the original on 2006-09-08. Retrieved 2007-01-03. ^ "Spitzer Sees Dusty Aftermath of Pluto-Sized Collision". NASA. 2005-01-10. Archived from the original on 2006-09-08. Retrieved 2007-01-03. ^ "Debris Disk Database". Royal Observatory Edinburgh. Archived from the original on 2008-08-10. Retrieved 2007-01-03. ^ "Mysterious Ripples Found Racing Through Planet-forming Disc". Retrieved 8 October 2015. ^ Heap, S (2000). "Space Telescope Imaging Spectrograph Coronagraphic Observations of Beta Pictoris". ^ a b Lagrange, A-M (2012). "The position of Beta Pictoris b position relative to the debris disk". ^ "University Of Arizona Scientists Are First To Discover Debris Disk Around Star Orbited By Planet". ScienceDaily. 1998-10-03. Retrieved 2006-05-24. ^ Schneider, G.; Becklin, E. E.; Smith, B. A.; Weinberger, A. J.; Silverstone, M.; Hines, D. C. (2001). "NICMOS Coronagraphic Observations of 55 Cancri". The Astronomical Journal. 121 (1): 525–537. arXiv:astro-ph/0010175. Bibcode:2001AJ....121..525S. doi:10.1086/318050. ^ a b Greaves, J. S.; Holland, W. S.; Wyatt, M. C.; Dent, W. R. F.; Robson, E. I.; Coulson, I. M.; Jenness, T.; Moriarty-Schieven, G. H.; Davis, G. R.; Butner, H. M.; Gear, W. K.; Dominik, C.; Walker, H. J. (2005). "Structure in the Epsilon Eridani Debris Disk". The Astrophysical Journal. 619 (2): L187–L190. Bibcode:2005ApJ...619L.187G. doi:10.1086/428348. ^ a b c d Harrington, J.D. ; Villard, Ray (24 April 2014). 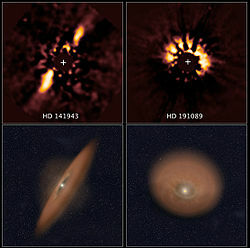 "RELEASE 14-114 Astronomical Forensics Uncover Planetary Disks in NASA's Hubble Archive". NASA. Archived from the original on 2014-04-25. Retrieved 2014-04-25. ^ Thomas, Paul J. (2006). Comets and the origin and evolution of life. Advances in astrobiology and biogeophysics (2nd ed.). Springer. p. 104. ISBN 3-540-33086-0. ^ a b Kenyon, Scott; Bromley, Benjamin (2007). "Stellar Flybys & Planetary Debris Disks". Smithsonian Astrophysical Observatory. Retrieved 2007-07-23. ^ Raymond, Sean N.; Armitage, P. J.; et al. (2011). "Debris disks as signposts of terrestrial planet formation". Astronomy & Astrophysics. 530: A62. arXiv:1104.0007. Bibcode:2011A&A...530A..62R. doi:10.1051/0004-6361/201116456. ^ "SIMBAD: Query by identifiers". Centre de Données astronomiques de Strasbourg. Retrieved 2007-07-17. ^ Greaves, J. S.; Wyatt, M. C.; Holland, W. S.; Dent, W. R. F. (2004). "The debris disc around tau Ceti: a massive analogue to the Kuiper Belt". Monthly Notices of the Royal Astronomical Society. 351 (3): L54–L58. Bibcode:2004MNRAS.351L..54G. doi:10.1111/j.1365-2966.2004.07957.x. ^ a b "Astronomers discover possible new Solar Systems in formation around the nearby stars Vega and Fomalhaut" (Press release). Joint Astronomy Centre. 1998-04-21. Archived from the original on 2008-12-16. Retrieved 2006-04-24. ^ a b Backman, D. E. (1996). "Dust in beta PIC / VEGA Main Sequence Systems". Bulletin of the American Astronomical Society. 28: 1056. Bibcode:1996DPS....28.0122B. ^ Sanders, Robert (2007-01-08). "Dust around nearby star like powder snow". UC Berkeley News. Retrieved 2007-01-11. ^ Lebreton, J.; Augereau, J.-C.; Thi, W.-F.; Roberge, A.; et al. (2012). "An icy Kuiper belt around the young solar-type star HD 181327". Astronomy & Astrophysics. 539 (1): A17. arXiv:1112.3398. Bibcode:2012A&A...539A..17L. doi:10.1051/0004-6361/201117714. ^ Lisse, C. M.; Beichman, C. A.; Bryden, G.; Wyatt, M. C. (1999). "On the Nature of the Dust in the Debris Disk around HD 69830". The Astrophysical Journal. 658 (1): 584–592. arXiv:astro-ph/0611452. Bibcode:2007ApJ...658..584L. doi:10.1086/511001. ^ Krist, John E.; Stapelfeldt, Karl R.; et al. (October 2010). "HST and Spitzer Observations of the HD 207129 Debris Ring". The Astronomical Journal. 140 (4): 1051–1061. arXiv:1008.2793. Bibcode:2010AJ....140.1051K. doi:10.1088/0004-6256/140/4/1051. ^ a b Kalas, Paul; Graham, James R.; Clampin, Mark C.; Fitzgerald, Michael P. (2006). "First Scattered Light Images of Debris Disks around HD 53143 and HD 139664". The Astrophysical Journal. 637 (1): L57–L60. arXiv:astro-ph/0601488. Bibcode:2006ApJ...637L..57K. doi:10.1086/500305. ^ Wyatt, M. C.; Greaves, J. S.; Dent, W. R. F.; Coulson, I. M. (2005). "Submillimeter Images of a Dusty Kuiper Belt around Corvi". The Astrophysical Journal. 620 (1): 492–500. arXiv:astro-ph/0411061. Bibcode:2005ApJ...620..492W. doi:10.1086/426929. ^ Moerchen, M. M.; Telesco, C. M.; Packham, C.; Kehoe, T. J. J. (2006). "Mid-infrared resolution of a 3 AU-radius debris disk around Zeta Leporis". Astrophysical Journal Letters. 655 (2): L109. arXiv:astro-ph/0612550. Bibcode:2007ApJ...655L.109M. doi:10.1086/511955. ^ Golimowski, D.; et al. (2007). "Observations and Models of the Debris Disk around K Dwarf HD 92945" (PDF). University of California, Berkeley Astronomy Department. Retrieved 2007-07-17. ^ Williams, Jonathan P., et al. (2004). "Detection of cool dust around the G2V star HD 107146". Astrophysical Journal. 604 (1): 414–419. arXiv:astro-ph/0311583. Bibcode:2004ApJ...604..414W. doi:10.1086/381721. ^ SU, K.Y.L. ; et al. (2008). "The exceptionally large debris disk around γ Ophiuchi". Astrophysical Journal. 679 (2): L125–L129. arXiv:0804.2924. Bibcode:2008ApJ...679L.125S. doi:10.1086/589508. ^ Stark, C.; et al. (2009). "51 Ophiuchus: A Possible Beta Pictoris Analog Measured with the Keck Interferometer Nuller". Astrophysical Journal. 703 (2): 1188–1197. arXiv:0909.1821. Bibcode:2009ApJ...703.1188S. doi:10.1088/0004-637X/703/2/1188. ^ Hines, Dean C., et al. (2006). "The Formation and Evolution of Planetary Systems (FEPS): Discovery of an Unusual Debris System Associated with HD 12039". The Astrophysical Journal. 638 (2): 1070–1079. arXiv:astro-ph/0510294. Bibcode:2006ApJ...638.1070H. doi:10.1086/498929. ^ Furlan, Elise; Sargent; Calvet; Forrest; D'Alessio; Hartmann; Watson; Green; et al. (2007-05-02). "HD 98800: A 10-Myr-Old Transition Disk". The Astrophysical Journal. 664 (2): 1176–1184. arXiv:0705.0380. Bibcode:2007ApJ...664.1176F. doi:10.1086/519301. ^ Kalas, Paul; Fitzgerald, Michael P.; Graham, James R. (2007). "Discovery of Extreme Asymmetry in the Debris Disk Surrounding HD 15115". The Astrophysical Journal. 661 (1): L85–L88. arXiv:0704.0645. Bibcode:2007ApJ...661L..85K. doi:10.1086/518652. ^ Koerner, D. W.; Ressler, M. E.; Werner, M. W.; Backman, D. E. (1998). "Mid-Infrared Imaging of a Circumstellar Disk around HR 4796: Mapping the Debris of Planetary Formation". Astrophysical Journal Letters. 503 (1): L83. arXiv:astro-ph/9806268. Bibcode:1998ApJ...503L..83K. doi:10.1086/311525. ^ a b Villard, Ray; Weinberger, Alycia; Smith, Brad (1999-01-08). "Hubble Views of Dust Disks and Rings Surrounding Young Stars Yield Clues". HubbleSite. Retrieved 2007-06-17. ^ Meyer, M. R.; Backman, D. (2002-01-08). "Belt of Material Around Star May Be First Step in Terrestrial Planet Formation". University of Arizona, NASA. Archived from the original on 2011-06-07. Retrieved 2007-07-17. Wikimedia Commons has media related to Debris disks. McCabe, Caer (2019-03-08). "Catalog of Resolved Circumstellar Disks". NASA JPL. Retrieved 2019-03-08.